A recently published survey* in the Journal of Human Nutrition caught my eye. It is an account of a large survey that highlights a Canadian perspective on life with coeliac disease and a gluten free diet. A questionnaire was sent to all members of the two Canadian coeliac societies and the results detail the difficulties experienced, the strategies used and the emotional impact of following a gluten free diet. It quantifies these before highlighting the need to improve the training and education of health professionals and the food service industry. The questionnaire, which was devised by the Canadian Coeliac Society, in collaboration with Health Canada, contained 59 questions divided into a number of different sections and questions identified from scientific literature, expert knowledge and psychometric expertise. It was sent out by mail in December 2008 to over 10,000 households for anonymous completion by anyone over the age of 18 following a gluten free diet. The response rate for inclusion was over 70% and of these over 85% had coeliac disease or dermatitis herpetiformis that had been confirmed by biopsy. The results make for interesting reading for anyone with a personal or professional interest in coeliac disease. For example whilst 90% of respondents cited usefulness of information from a coeliac disease support association as very good (or excellent) only 52% gave a similar score to information from a dietitian, 43% from a gastroenterologist and 25% from the family doctor. Cookbook information gained 62%. Questions were included on both positive and negative emotions experienced both in the month prior to completing the questionnaire and in the first few months after diagnosis. Comparisons between these time points are included in the results and in the discussion. Of the positive emotions experienced, relief and accepting of the diet were scored whilst the negative emotions included feeling frustrated, overwhelmed, isolated, confused, anxious, sad, anger and feeling depressed. The highest percentage of respondents experienced frustration and isolation during the month before the survey at 21% and 16% respectively. Over 50% of those who had followed a gluten free diet for over 5 years still experienced often or very often over one third of the 39 difficulties that had been included on the questionnaire. Many of these difficulties related to eating out including limited food choice in restaurants, limited choice of restaurants, worrying about restaurant cooks not being trained in preparing gluten free meals, difficulty obtaining gluten free meals in hospitals and retirement homes, and food associated difficulties whilst traveling. Non eating-out difficulties included finding out the gluten free content of medications and vitamins and limitations placed on religious practices. Whilst many of the above difficulties probably come as no surprise to anyone who has ever followed a medically prescribed diet, some of the high percentages of answers to the section on emotions having been scored as ‘experienced often’ may be less obvious. For example not liking friends and family to feel sorry for them (66%), people thinking a ‘little gluten’ won’t harm them (46%) and feeling a burden (33%) is included in this category. 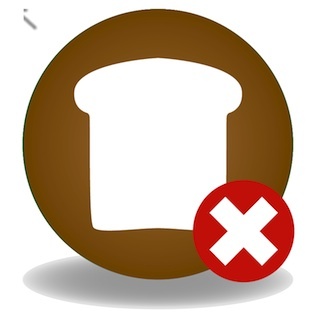 Here at Awkward Eaters, the following results (although from Canada) in the restaurant and eating out related sections make us more determined to make awkwardeaters.com an easy to use and valuable resource for anyone following a gluten free diet, but especially for users with coeliac disease and dermatitis herpetiformis. Interestingly, only 27% cited ‘research restaurants on the internet before traveling’ and 24% ‘use internet to find restaurants that serve gluten free foods’ although as the survey was conducted in 2008 this is likely to have increased along with general internet use. The survey also included large sections linked to buying gluten free foods to eat at home and cooking gluten free. However, what isn’t mentioned or presumably questioned about is the presence of any additional dietary restriction and how that compounds the difficulties. We know for example that being gluten free and vegetarian (or being gluten free and dairy free) isolate awkward eaters even further and so far I am not aware of any major surveys that measure the experiences of multiple food group avoiders. As awkwardeaters.com grows in the coming months and years we like to think that we will be doing something very practical to help everyone whatever their ‘can only eat’ and ‘will only eat’ food groups and combinations. *‘Living with coeliac disease and a gluten- free diet: a Canadian perspective’ by M Zarkadas and co, published in the February 2013 edition of the Journal of Human Nutrition and Dietetics (the official journal of the British Dietetic Association).